From soft and sandy to hard as a rock, this trencher is designed to perform. 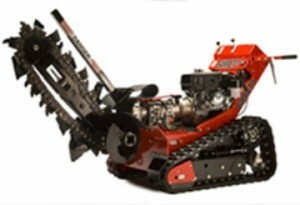 The TK trenchers feature a 7.1” wide track that creates 241.4 square inches of footprint on each side of the machine. This gives you outstanding traction on wet soil, clay, sand or steep terrain while softening the impact on any existing landscaping. The track absorbs most of the impact caused by rocks, roots or other obstructions in the soil. The TK features a weight advantage that improves traction, reduces impact and provides stability. To ensure safer operation, a separate valve is incorporated between the hydrostat and track drive motors. This disconnects the track drive from the pump so there is no possibility of the trencher creeping when the clutch is released. The operator friendly one-handed control takes the effort out of operation – just twist the handle to turn. It features variable speed drive in forward and reverse. The safety clutch on the handlebar engages and disengages all of the hydraulic power to the wheel drive and digging chain without killing the engine or using micro-switches. The set and go controls eliminate fatigue often caused by other machines that require you to maintain constant pressure on the controls. Low maintenance and hardworking, the TK trenchers are reliable in the most difficult conditions. The simple steering, large tracks and size of this trencher make the operator’s job simple and keeps your customer satisfaction high. With accessible yet protected components, maintenance costs are minimal.